We often hear from individuals or parents/carers about their concerns about bullying in a sports environment. We understand that bullying can happen anywhere at any time and that it does happen in sports clubs in and out of school. Often people taking part in the sports clubs do not feel able to express how they feel if they are being bullied in case they get told that they are weak or they are worried they may get kicked off the team. We often hear that some people who fear reprisals or the bullying getting worse. Are you being bullied in sports? If you're a young sports player and you're feeling upset at the way you're being treated on the field by your team mates or adults involved in the game then there are things you can do about that. If your team mates make fun of you on the pitch or in the changing room, or try to upset you to put you off the game so that you don't want to take part in training sessions, that could be bullying if it keeps happening. It is important to try and trust your instincts as to whether it is bullying or something that is just a joke between all the team. If it upsets you or it is become persistent then this could be bullying. There are a number of types of bullying that can occur in sport clubs. You may find name calling and verbal bullying where someone is being given cruel nicknames, taunted, threats and intimidation. A person may be subject to physical bullying which could be hitting, slapping, tripping and anything else that causes physical harm. We also hear about social bullying in sports where players will gossip about others, leave someone out or embarrass players in front of others. What action you can take? Ask friends on the team to back up what you say if this is possible. Sometimes others may not want to get involved as they might be worried the bully will bully them. If the problem isn't resolved, your parents should ask the coach or team manager for a copy of the complaints and/or bullying policy. 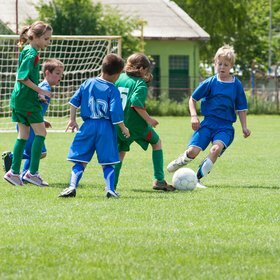 Has your child suddenly lost interest in the club/sport? Has your child refused to attend or make excuses not to go? Do they say they are feeling unwell or look anxious about going? Have you noticed a change in their behaviour such as more snappy then usual or perhaps feeling low? Do they get agitated before going to their sessions? If your child has confided in you, it is important to listen to what they say and allow them to have a say in the action. They may want to take their time as it may be a sensitive situation, so as important as it is to go at their pace it is essential to also encourage them to get this sorted sooner rather than later before it escalates. Understand and respect their concerns and fears which are very real to them and need sensitivity. They may be worried they will get further bullied or kicked off the team or perhaps substituted all the time. Agree a way forward with your child, and plan to meet with the coach as a united front. Speak to the coach, let them know you understand that banter can be high-spirited in sports but now it is becoming persistent it is damaging confidence and increasing anxiety and this is bullying. Be assertive with the coach if you need to be as we have heard from parents that a coach or sports leader had attempted to sweep things under the carpet. Ask the coach for a copy of the anti-bullying policy too. It is important to support your child through this process too. Give your child a listening ear, space to talk and reassurance. Please read our advice on what to do if your child is being bullied. There have been many reports and accounts of bullying amongst parents and supporters who are watching from the sidelines. This has resulted in extreme cases, parents or supporters being banned from watching their children participating in games. Some of the bullying reported has been parents abusing other people's children during the games, threats and even physical violence. There has also been reports that the bullying has escalated on social media. This should not be tolerated by the clubs and coaches in any shape or form. If you have experienced this, speak to the coach and ask for them to intervene and take necessary action. We understand how there can be lots of high spirited behaviour and banter within sports teams. Quite often we appreciate this is encouraged to help a team bond and allow team members to get to know each other. However, there is a fine line between bullying and banter. If the banter targets one person and becomes persistent, this then becomes bullying. If it upsets the individual and has potential to damage their passion of the sport, self-esteem, confidence or ability to take part then this becomes bullying. It is said to get the most out of the team or individuals it is important to encourage praise, support and unity rather than negative behaviour. Has your club got an anti-bullying policy? If yes, it is important to review it regularly and ensure it is up to date. If you haven’t, then it is important to write one that works for your club, the players and supporters. Once you have an anti-bullying policy, everyone involved in the club needs to be aware of it and perhaps even sign a declaration they have understood it and adhere to it. This will give everyone some responsibility to act in a positive way in sports. Develop a clear strategy to deal with negative and bullying behaviour with clear consequences so team members and their families understand that the sanctions. It is important that all policies are transparent and available for everyone so they know what to expect and what is expected of them. It may help to have posters in the changing rooms to show your club is against bullying in any shape or form. Also it is crucial that you remain vigilante and know what signs to spot of any bullying behaviour within your team as it may not be always obvious. Leaders and coaches of the sports clubs need to take a strong stance against bullying and let the members of their clubs know that this is not going to be tolerated. By having clear policies and strategies in place, the culture of bullying in sports can be changed for the better across the board. Coaches should work on building character and confidence as well as the sport as this will in turn give the children a fun and competitive experience. This article is supported by The Ben Cohen Stand Up Foundation.